To go with my Kholrabi bharta and to use up 2 bunches of radishes, I decided to make some mooli parathas (radish flatbread). A food processor with a grater disk (yes, you can grate by hand but radishes are tiny and the food processor is so much quicker!). My kitchen helper did this part (and the rolling of the parathas later). Mix together all of the ingredients in a mixing bowl and knead until it comes together. Add water or yogurt if it’s too dry. Roll into golf ball sized balls…if that seems too big, make them smaller (makes probably 15-20 depending on how big you make the balls. Cover with a cloth if you’re not rolling them out immediately. Roll out into think disks. (it’s ok if they’re not perfectly round…ours weren’t. some of ours were oblong like naans. they still tasted perfectly good. Heat up a skillet on medium. rub a spoon of oil onto it. Cook the parathas (you can usually do 2 at a time) in the skillet…flip it when one side browns and rub with a little butter. let the other side brown too, rub with a smidge of butter, and then put it into the foil or the container to keep warm. This entry was posted in Recipes, Recipies, side and tagged CSA, indian, paratha, Radish. Bookmark the permalink. Thanks for the recipe! We usually have too many radishes in our CSA share and this looks like a delicious way to use them. yum! I would love for you to link up to my CSA link party and share this lovely recipe. 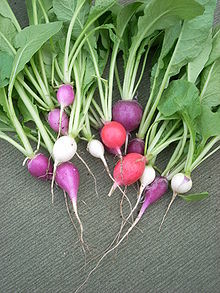 I have tons of participants who seem to need some inspiration for using their radishes. Come check it out…http://inherchucks.com/2012/05/24/whats-in-the-box-27/. Hope to see you there!